This is a poster for the upcoming movie Toy Story 3. This is an interesting movie poster. It doesn’t even have the title of the movie on it. Actually, none of the American posters that I’ve seen (and there have been quite a few so far) have the title on them! This one easily gets away with it by having nearly all the major, and several of the minor, characters from the previous two movies (along with what appears to be quite a few new characters) crowded into the frame with the 3. And this has generally been the theme of posters for this movie. There is a whole line of character posters (which I am not going to post) that each simply features one of the major characters we already know with that 3 in some dynamic, characteristic way. None of the posters features any other text prominently. No movie name. No character names. No tagline. This entry was posted on March 15, 2010 at 12:00 pm	and is filed under Entertainment. 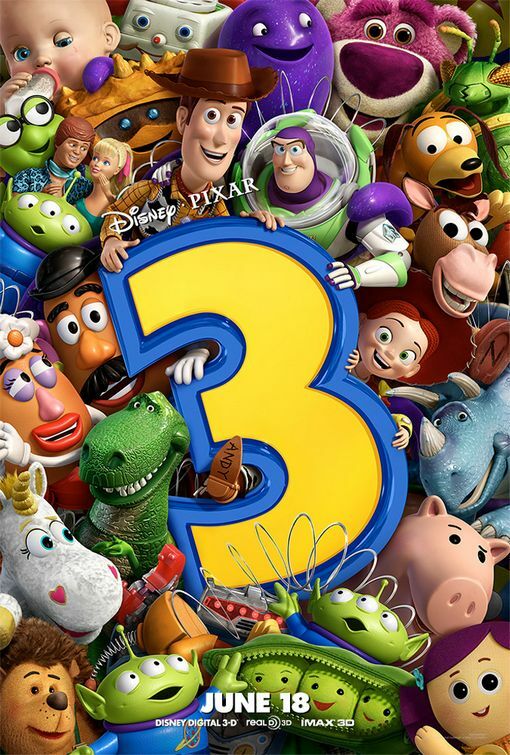 Tagged: movie, poster, toy-story-3. You can follow any responses to this entry through the RSS 2.0 feed. You can leave a response, or trackback from your own site.